Our design team has successfully completed numerous Fire Department, Police Department and Public Safety Complex projects, including studies, renovations & additions, and new construction for urban, suburban & rural communities. Our long experience with municipal facilities, thorough knowledge of public bidding laws, applicable codes, and sustainable design practices, along with a keen understanding of the construction process, provides our team with the proven ability to identify issues and provide creative, practical design. The unique, split-level design of the West Boylston Police Headquarters, facilitated to accommodate a narrow, moderately sloped site, gives the building's exterior a contemporized / traditional appearance that fits within the surrounding residential district. Energy-savings materials are utilized to cut costs and lighten the building's carbon footprint. The Police Dept., served by a regional Dispatch Facility, is designed to “go dark” or closed to the public at night while maintaining emergency communications and shelter for members of the community who arrive after hours. This allows for a local police patrol presence to be maintained continuously . Design for renovating approximately 2,280 square feet of the existing building, adding approximately 6,000 square feet of program space to the fire station and redesigning the present site to accommodate the new facilities. The project added a community room, expanded facilities to accommodate female firefighters and upgraded all utilities, including future connection to municipal sewers in the area. In addition, the station serves as the main emergency response facility with ambulance for its section of the city. The building received the 2011 Excellence in Construction Award by the Associated Builders and Contractors and is the first LEED Gold-certified facility on the campus. Programming, design and construction administration services for a new public safety complex of approximately 22,000 s.f. to house the Police & Fire Departments and the town’s Emergency Dispatch Center. 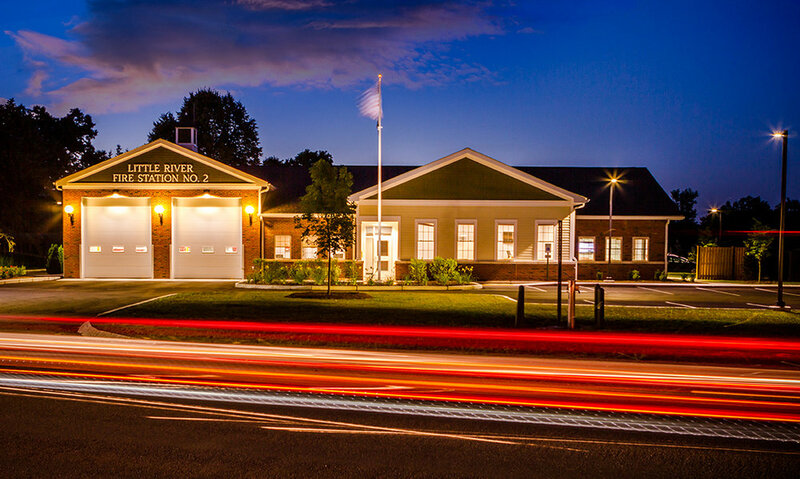 CBA was on the design team for the feasibility study and design of two fire department facilities for the Town of Hampton, New Hampshire. The 11,000 s.f. substation replaces the 86 year old headquarters facility which was located on Ashworth Ave. at Hampton Beach. The new facility houses four emergency response vehicles and contains a dayroom, dormitory and locker facilities for a crew of nine. Programming, design and construction administration services for a new 38,000 s.f. facility housing Police, Fire and Central Dispatch for the City on a former factory site. Building off of the current Turner House facility, this 11,000 sq.ft. facility houses the Town’s dispatching center, serving the Police, Fire, EMS and Emergency Management Departments. The facility also includes Police Department offices, an Investigation Department, Squad Room, spacious Training Room, Evidence Processing Department, three Holding Cells and a Police Garage. The design reflects the surrounding residential neighborhood and the New England “saltbox” massing of the Turner House. Detailing of the facility provides comfortable access for the public, while maintaining secure separations for police operations. Phase I – Renovations to the Police facility, including the dispatch room, locker rooms and Training Room. Upgrades to UVAC, lighting, electrical, fire alarm and emergency power as well as a general roof replacement. Phase II – Replacement of existing boilers and upgrades to the Boiler Room. Miscellaneous renovations in the jail cells, booking area, Police & Fire Department common areas, Fire Department kitchen, fitness room and locker rooms of both departments. A building control management system, new water main and meter will also be installed. Constructed in phases to ensure uninterrupted department operations, the Northampton Police station houses a 75-person staff consisting of administration, detective, traffic and records departments. The facility includes an evidence-processing center, forensics lab, nine holding cells, fitness center, dispatch area and shooting range. The main meeting room is used for classes, training and community events with public parking provided in the lower level of the garage. Energy efficient features include daylight-controlled lighting systems; high efficiency boiler plant and air conditioning systems; a high level of occupant-controlled HVAC systems and low consumption plumbing and water related equipment. The new headquarters has achieved LEED Gold certification. Programming, design and construction administration services for a new two-story addition to the present District No. 2 Fire Station Building. The addition includes an office for the Fire Chief, the Water Department and the Prudential Committee. Storage rooms were added on the upper and lower levels. Programming, design and renovation administration services for a new 12,400 s.f. fire headquarters. The station includes administration offices, training rooms, fitness center and a drive-through apparatus bay to house department vehicles and equipment. The design enables the kitchen, dining room and training rooms to be used for public functions while the remaining areas of the station can be separated for emergency responses.